The Carnivore™ is a deadly-accurate, multiple-caliber suppressor, with the durability needed for .300 Win. Mag. The new, lightweight design excels for precision shooting and hunting duty. At only 9.2 oz., the Carnivore™ is the lightest suppressor in its class. What it lacks in weight is added in durability, perimeter-welded stainless steel baffle stack and an aircraft-grade aluminum exterior guarantees the Carnivore™ will stand up to a lifetime of use. It’s rated for all centerfire rifle cartridges up to .300 Win. Mag., reducing a painful muzzle blast to hearing-safe levels below 139 dB. The Carnivore™ is so effective, it suppresses 10 dB better than a quality pair of electronic muffs. 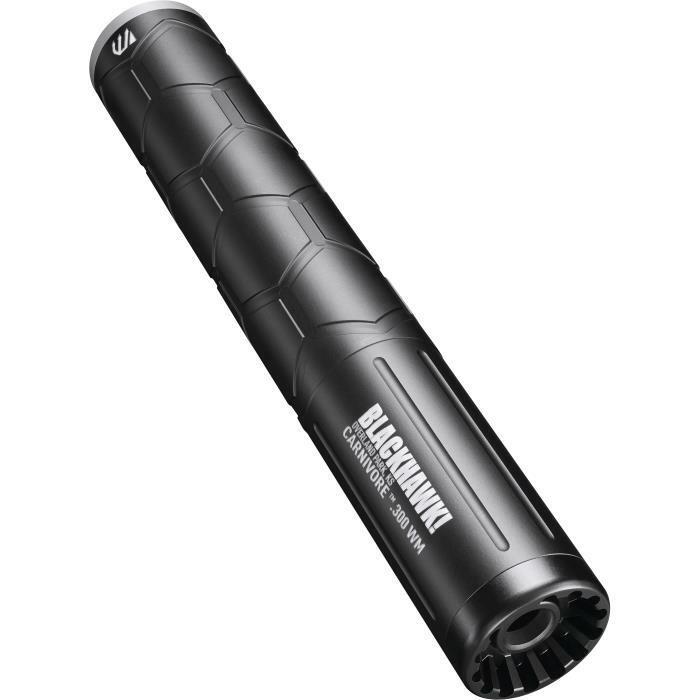 The Universal BLACKHAWK!® Suppressor Tool is included. (Mounts sold separately).